Today’s post was inspired, once again, by WWR follower Graham Clayton who, by bringing one of these discs to my attention, reminded me that I had not posted the other. The first disc, one I had never heard before Graham mentioned it, comes from the New York-based psychedelic act the Blues Magoos. Pretty much unknown in the UK, they scored a solitary hit in the US in 1967 with the single We Ain't Got Nothin' Yet. Originally formed in 1964 as the Trenchcoats, by 1968 – after releasing a string of flop singles - the band had fractured in two and, after issuing a couple of poorly-selling albums, by 1972 they were gone for good. Or so it seemed. In 2008 the Blues Magoos (featuring original members Ralph Scala, Peppy Castro and Geoff Daking) reunited for two concerts, including one supporting The Zombies at the Fillmore New York. Since then the band has continued to play live and, in 2012, they issued their first new album in 42 years, Psychedelic Resurrection. However the track we feature today comes from the B-side to their 1967 flop single One By One. The utterly peculiar Dante’s Inferno, credited to all five members of the band, is a shockingly awful psychedelic jam that should never have been committed to tape and, quite obviously, took about as long to record as it does to listen to. The Brian Auger-like keyboard stabs, ridiculous guitar work and Yoko Ono-esque wailing make it sound like a Mothers of Invention live outtake. Ignore the crackling at the beginning of the disc: it’s not scratched – them’s ‘flames’ you can hear. 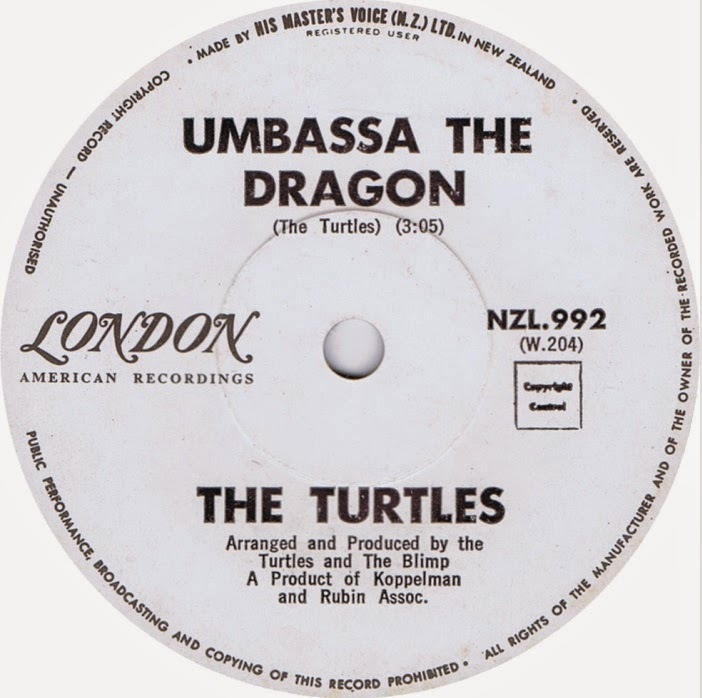 Hearing that abomination reminded me of another B-side by another 60s US outfit, this time the much more successful – with well over a dozen hits on the Billboard charts - The Turtles. The band, led by vocalists Howard Kaylan and Mark Volman (who would later become known as Flo and Eddie and would join Zappa in the Mothers of Invention) are best known for their international hit Happy Together, although they scored their first hit with a cover of Bob Dylan’s It Ain’t Me Babe in 1965 and would continue to make the charts until 1970. 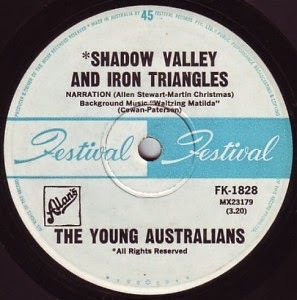 Recommended to me by WWR follower Graham Clayton, today’s disc, the peculiarly-named Shadow Valley and Iron Triangles, is three minutes of turgid Australian jingoistic nonsense masquerading as a call to arms to support the conflict in Vietnam . The title isn’t mentioned in the ‘song’, but it’s fairly safe to assume the ‘shadow valley’ part references the Lord’s Prayer; according to Wikipedia ‘In United States politics, the iron triangle comprises the policy-making relationship among the congressional committees, the bureaucracy, and interest groups’. Written by Andrew Jones MP (who, at the time, was the youngest person ever elected to the Australian House of Representatives: he’s not the same Andrew Jones MP who is currently serving as the Conservative member for Harrogate) Shadow Valley and Iron Triangles is credited to the group The Young Australians but is actually narrated by Rex Heading, a former DJ turned TV exec who went on to create the popular Aussie kids’ character Humphrey B Bear, over a version of the standard Waltzing Matilda. Issued in 1967, although the song was banned by several radio stations it was a sizeable hit in certain parts of the country, even reaching Number One in the Adelaide district. Young and idealistic he may have been, but Jones – who was elected to the House of Representatives in November 1966 – was perhaps not the best person to be playing at politics. In the same year that he had his hit single the naive young Liberal MP made the mistake of telling a journalist that "half the MPs in Parliament are drunk half the time". His faux pas ended in humiliation: he was forced to stand in the House of Representatives and apologise to Parliament. The song later appeared on the 1986 double album Bob Hudson & Glenn A. Baker Present Antipodean Atrocities: Dubious Ditties, Patriotic Pap and Enthusiastic Excesses that Made Australia Grate. Unfortunately I’ve not been able to track down an audio clip of the song’s B-side Too Many Twisted Trails. Anyone out there help with that? Welcome to the utterly deluded world of Melvin G Fromm Jr, the singer-songwriter who, for the last 15 years or so, has quietly been beavering away at the coalface of country-lounge music. Hailing from the town of Gap in Pennsylvania, since 1999 Fromm’s fertile mind has been responsible for more than 270 finished and recorded songs: all of which are, at the very least, a little off-kilter and some of which are hideously brilliant. When listening to the wild song stylings of Melvin G Fromm Jr I am immediately reminded of two of my favourite bad singers – Nicholas Gilio and W L Horning, both of who have featured on this blog before. Often, as was also true of both Gilio and Horning, Melvin has employed modern-day song-poem outfits and session singers to add a bit of spit and polish to his tunes. Again like both Wesley and Nick, Melvin also occasionally takes his own turn behind the microphone – with spectacularly inept results. Inspired by his international success, Melvin formed the four-piece band Fromm's Country Music to create what his official press release describes as ‘an exciting, diverse sound which appeals to lifelong country fans as well as bright eyed newcomers. With plenty of contemporary pop sensibilities and a strong inflection of Christian values, Fromm's Country Music fits comfortably into fan's minds and hearts’.The band has issued four albums along with many, many download-only tracks. 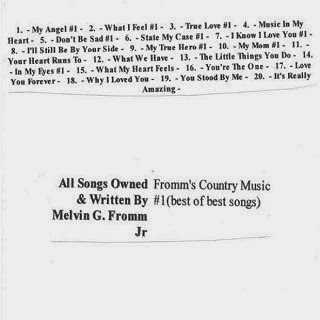 More recently Melvin has attempted to branch out into the song-poem field on his own, offering would be hit songwriters the chance to have their poems enhanced by a Melvin G Fromm tune. I’m guessing his latest business venture proved unsuccessful: at the time of writing Mel’s website www.frommscustomsongs.com is in hibernation. All of Mel’s tracks can be purchased from www.productiontrax.com and a whole bunch are available via CDBaby and iTunes. Go have a listen…you’ll find some perfectly ordinary country songs performed by various members of Fromm’s Country Music as well as many. Many examples of Melvin at his best (or worst).